Burns to any area of the body adversely affects the skin in two ways. 1. It disables the skin's ability to act as a protective barrier, and 2. it inhibits the function of the components underneath the skin. This is especially true in the foot where depending on the severity of the condition, the ability to ambulate can be greatly limited. This is particularly true with diabetics who in many instances have impaired circulation to the foot, neuropathy and impaired immune response particularly if their blood sugars are poorly controlled. Skin functions as an organ whose primary purpose is to provide a protective barrier against the environment. Burns represent a complex injury causing superficial to severe destruction of this barrier. Specific to the lower extremity, burns may adversely affect the ability to bear weight and for this reason burns of the lower extremity are not considered minor. In fact, the American Burn Association classifies them as major injuries. The goal in any severe injury involving the lower extremity is to be able to have the individual maintain foot and ankle function that allows for ambulation. Simple burns are generally not an issue, but severe burns which involve not only the skin but underlying structures like tendons, ligaments and blood vessels will generally require hospitalization as well as a period of rehabilitation. The skin structure of the foot is unique compared to other areas of the body. The skin on top of the foot is generally thin with very little fat beneath it in order to allow the tendons to slide back and forth in an effort for the toes to move. A burn to the top of the foot therefore could cause adhesions which may end up restricting motion of the tendons and limit the ability to ambulate. This is also apparent in the ankle joint where once again the skin is very thin and a burn injury could impair the movement of the tendons around the ankle. The bottom of the foot is somewhat different in that the skin particularly around the heels is thick and there is much more fat on the bottom of the foot to aid in shock absorption when ambulating. This "extra" fat is tightly attached to the skin on the bottom of the foot. This set up allows the bottom of the foot to better absorb the shearing forces which occur when walking. Thus, destruction of the skin and closely attached fat on the bottom of the foot would make the ability to walk very difficult if this structure was destroyed. Burns may be classified based on the degree of severity. First Degree-superficial, painful burn that often appears as erythematous (redness) but without blisters. Generally will heal without scarring or discoloration. Second Degree-partial thickness (partial skin layer destruction), painful burn associated with blisters and erythema. 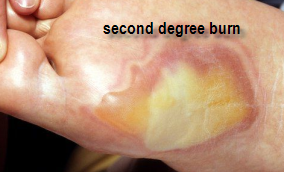 Third Degree-full thickness (full skin layer destruction), painless burn which may have a waxy, white or necrotic (death of tissue) appearance. Will often heal with a scar or require skin grafting. Fourth Degree-full thickness, painless burn involving muscle and possibly bone. Irreversible damage to deep tissues resulting in deep tissue death. The severity of a burn is directly related to the agent causing the burn and the amount of time the skin is in contact with the agent. It has been found that even with lower temperature agents, the longer the agent is in contact with the skin, the greater the degree of injury. In more severe burns, the initial presentation may be misleading when evaluating the degree of injury. Initially edema (swelling) will occur at the burn site particularly in the lower extremity, but often the full extent of the injury does not become apparent up until 24 hours later. first and second degree burns-simple first aid is called for. In general, areas of 3-4 inches in diameter may be self treated. Included in this treatment would be to hold the foot under luke warm water. Do not use cold water or ice.. The burn area needs to be covered as this protects the delicate skin and blisters and helps reduce pain. Use loosley wrapped gauze, too much pressure will cause pain. Do not use tissue or cotton as these materials will stick to the wound and will actually increase pain and chance of infection. The gold standard in topical medication for burns is an agent known as silver sulfadiazine (Silvadene). If the burn has blistered, do not puncture the blister, as they would be more susceptible to infection. Take an over the counter pain reliever such as aspirin, Tylenol, Aleve, etc. to reduce discomfort as well as elevating the foot. Most minor burns will heal uneventfully, but it is advised to observe the area for any sign of infection which would then necessitate medical attention. Depending on the severity of the first or second degree burn and the agent that caused the burn, there may be some pigment changes, meaning the burn site may end up being a different color than the surrounding skin. Avoid sun exposure to this area as the sun may actually worsen the appearance. third and fourth degree burns-while a prolonged course of therapy may not be ascertained initially, certain aspects of treatment should be started immediately in an effort to relieve pain and prevent further burn destruction. This would include elevation of the limb in an effort to reduce swelling and the rush of blood to the foot which may further increase pain. Cooling of the involved area should also be started immediately. This is done not with ice but instead with luke warm water compresses (approximately 77 degrees F). At this point, again, depending on the severity of the burn, medical attention may be required. The first thing medical personnel will look at is the circulatory status of the foot. Excessive formation of edema after the injury can cause impaired circulation of blood flow into the foot and in severe cases may lead to tissue death (gangrene). Prophylactic antibiotics may also be started immediately in an effort to prevent the burn area from becoming infected. It has been shown that with third degree and fourth degree burns, the quicker a person is hospitalized and the burn treated, the lower the incidence of cellulitis (infection), the shorter the hospital stay, less chance of grafting and less development of scarring. In very severe burn cases where loss of pedal function occurs, reconstruction of the foot and ankle may be necessary. If there has been extensive damage to the skin, then skin grafting will be necessary. In cases where there is deeper damage and a skin graft alone will not suffice, muscle flaps may be required as they will allow for better covering of the exposed areas. Severe burns of this nature also end up causing damage to the tendons, vascular and nerve structures in the foot. In general, they cause contracture (shrinking) of these structures, so the course of therapy in these cases is to make sure there is adequate circulation getting into the foot and in many instances surgery on the tendons in an effort to lengthen them is necessary in order to give the foot better function. Finally, think all burns are heat induced? Take a look at the picture to the right. This first degree burn is the result of over icing an area of the foot for an acute episode of plantar fasciitis. This burn would be treated in the same manner as any other first degree burn. The lesson learned here is to never over ice an area in an effort to reduce pain and swelling. I believe in using ice for a musculo-skeletal injury only during the first twenty-four hours after an injury in an effort to reduce swelling and thus pain. After twenty four hours I have my patients switch to moist heat in an effort to promote healing through the increased flow of blood to the injured area. If you are going to use ice, you should not apply the ice directly on the skin but should separate the ice from the skin with a thin towel. Leave the ice in place for 15 minutes, remove for a few minutes and then replace for another 15 minutes.